Over Memorial Day weekend I decided to go ahead and drive back up to Satori and complete a couple of tasks. 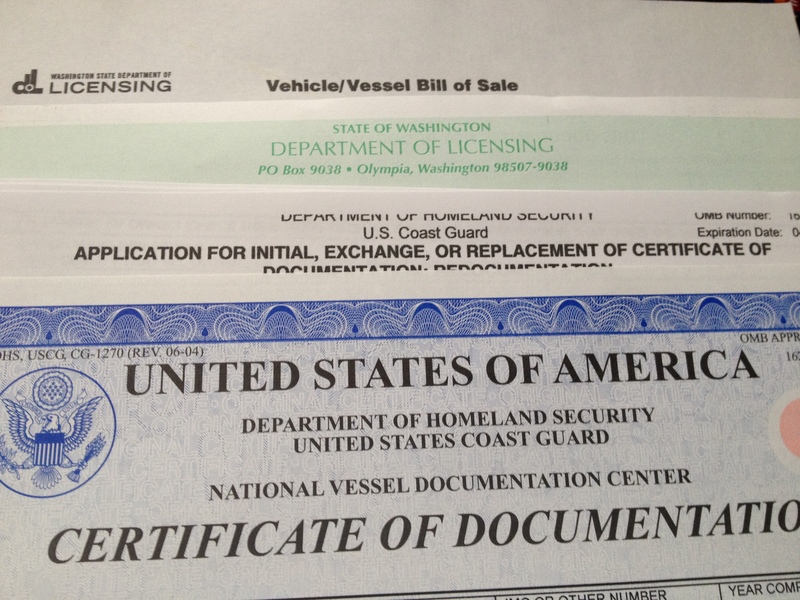 First off I wanted to finalize the payment and get the title in my name. 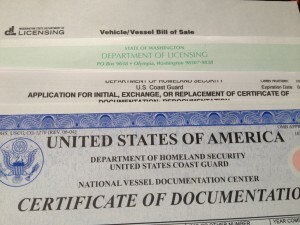 I’m not really anticipating that anything would happen between now and September but to take some stress off of me and to make sure the owner knew without a doubt that I’m not backing down I gave him a cashiers check and he will be sending me a bill of sale that I can take to the licensing office and get the vessel in my name. 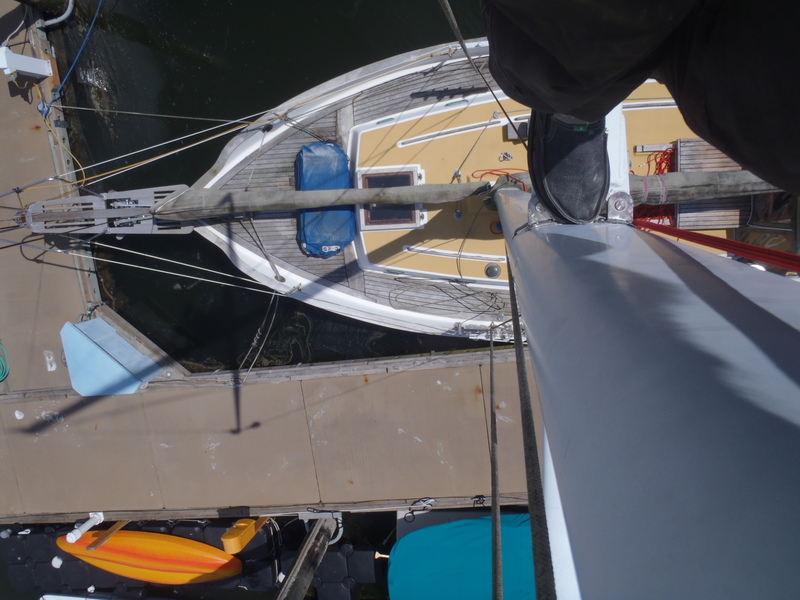 On top of that I wanted to go ahead and start inspecting the rigging from the top of the mast all the way to each turnbuckle or anchor point so I decided to climb the mast and take some photos of the rigging so I could take them home and inspect everything in better detail. 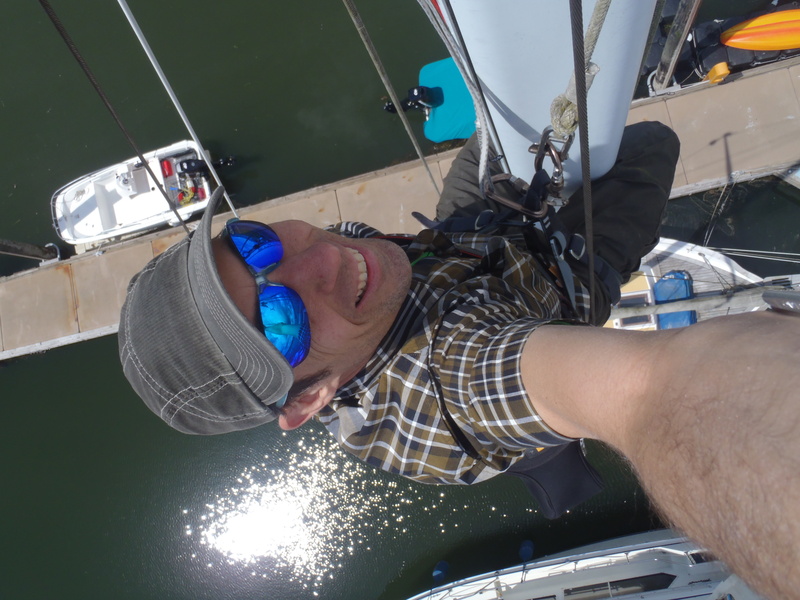 It’s the first time I’ve ever climbed a mast and although I have plenty of rope skills from rock climbing and mountaineering, it had been a while since I used prussiks to climb up a rope. At first I only had two prussiks; one that I could step into and the other attached to my harness. I also had a halyard as a backup in case the main halyard failed for any reason. About half way up I decided to add another prussik under me to allow me to step into two stirrups. After getting to the top I snapped a bunch of photos of the mast, spreaders, pulleys, lights, etc and then rappelled off. 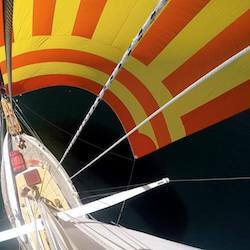 The next task was to raise the sails and inspect everything to ensure they won’t tear or have any problems while underway. At first I was just planning on getting them in the air but after an intelligent discussion we decided the best option would be to remove them from the boat and have them serviced in Seattle. It was also a good way for me to get acquainted with the sail rigging. 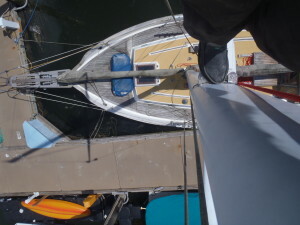 The mainsail is attached to the boom and mast with shackles that require a flathead screwdriver to remove. On the ends where water was obviously leaking into the shackle the screws were welded shut and took some very careful pressure to unscrew. I also added a little WD40 to assist in unscrewing the screw which was pretty helpful. After removing the mainsail I then removed the staysail and carted them all up to my car. At first I just stuffed them into the cartop box and hatchback of my Subaru. 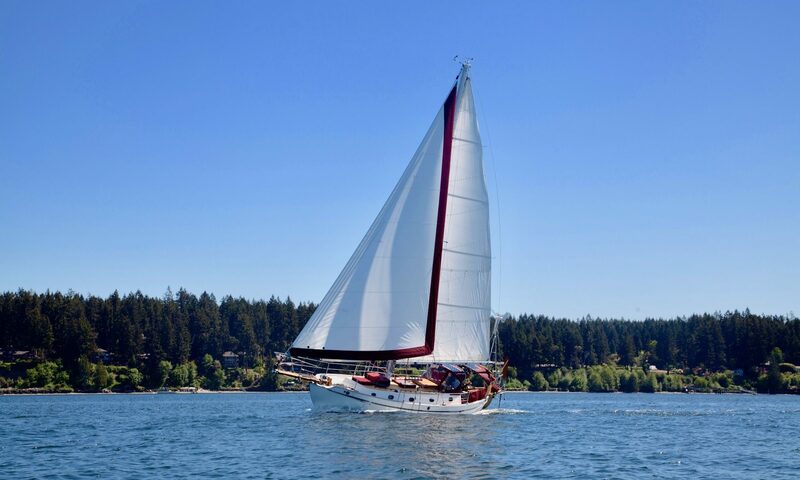 Later on that evening I went to a friend’s vacation house on Whidbey Island where I had my very first experience sailing a San Juan 21 and folded them up nicely. 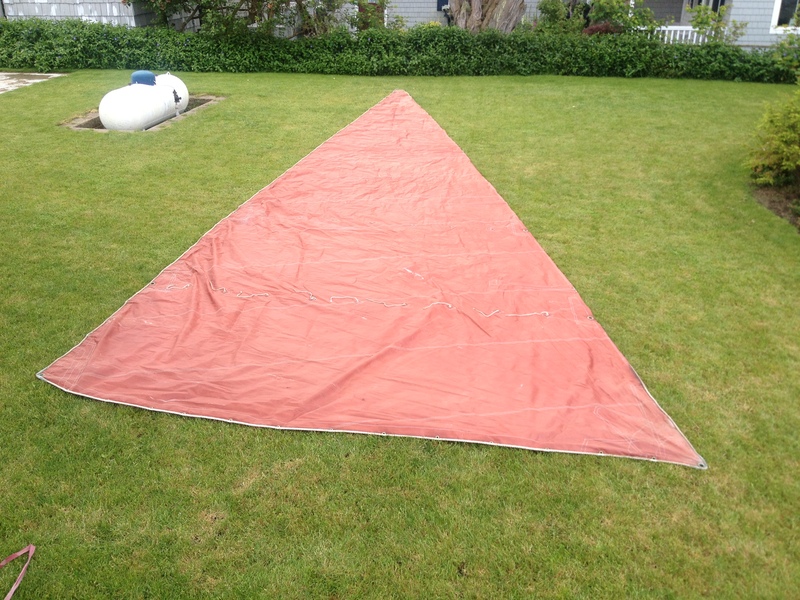 It turns out that the sails on Satori were made by a local sailmaker about 3 miles from my house called Schattauer Sails Inc. A quick call this morning confirmed that I can bring them in to be inspected and repaired/serviced and then they plan to outsource the sail covers to someone locally and get them ready long before bringing her down to Seattle. Next on the to-do list is to get new spreader tang cables. For whatever reason the cables are missing on the spreader hanger tangs so I’ll need to find out what I need to do to get new ones and place an order. Since I’m already planning on ordering parts from LeFiell Masts, I might as well get some replacement sheaves since the old ones are original.